We take orders directly from customers in the UK and Ireland, and have a network of UK dealers. We also have a number of distributors and dealers overseas, which is where most of our products are sent. To find one in your area, please use the 'Distributors' drop down menu above. Having overseas distributors and dealers enables our products to be purchased more easily outside the UK and for local advice to be given. Where appropriate, we therefore direct each overseas enquiry or order to the relevant appointed distributor. We are very keen to make our products available to members of the public outside the UK. Accordingly, where it is not otherwise possible for our products to be acquired locally through a dealer or distributor, we will supply direct from the UK. Therefore, if you are based outside the UK, and you are unsure whether we have a local distributor or dealer who can supply the products in which you are interested, please check with us first by email or telephone. To place your order with us directly in the traditional way or to receive advice before ordering, either contact us or telephone us on +44 (0) 1729 823 873 (or even write to us). If you're emailing via Outlook, please ensure that the words ‘Ringmat Enquiry’ is shown in the subject heading or use our web browser based email system. At any time, if you have any queries, we suggest you contact us so that we can then attend to you on a personal basis, including the provision of appropriate advice, where necessary, before any order is finalised. For UK orders, there is a now no charge for postage and packing. With regard to product availability, we can usually despatch within 5 working days, depending on the work involved in preparing the products ordered if they are not readily ‘off the shelf’. Some may take a bit longer and, in such cases, customers will be advised, if possible, within 2 working days, through the contact details provided with the on-line order. Should you not be able to notify us of any mistake until after the order has been despatched, notify us straight away and return the goods to us. Ensure that the value of the goods returned is covered by the carrier and upon receipt of the items returned, in good condition, your card will be refunded with the cost of the goods ordered. Remember, all products purchased from us have a no-quibble money-back guarantee when you buy them, as has always been the case. As before, you can also order Ringmat Products On-Line. Ringmat followers will be aware that our on-line ordering system has seen little change for many years but in the meantime technology has moved on apace and it is time for change. We are very proud of our British heritage and had hoped to find a satisfactory British solution for a new on-line shopping facility, but have so far drawn a blank within the very limited time we have available amongst a busy schedule. More to the point, the company that has accommodated our existing on-line shopping facility is no longer offering this type of service and therefore we have been forced to make alternative arrangements within a short space of time. Accordingly, we have arranged with our UK distributor, Moth Group, to act as our on-line supplier. Followers will remember Moth Group from the days when we attended British hi-fi shows on the same stand as Moth Group, who also then attended as the Hi-Fi News Accessories Club. For some years, Moth Group has had an on-line audio shop under the name of www.britishaudiostore.com, which, in turn, has contained a separate Ringmat Developments section. This section is being expanded to incorporate all of our products and that process will continue as we develop more products. In future, customers wishing to buy our products on-line will be directed straight to the Ringmat Developments section of www.britishaudiostore.com. 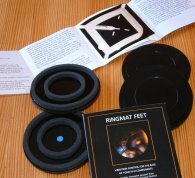 In practice, most of the on-line orders for Ringmat Products will in future be despatched direct by us, as and when Moth Group receives them via www.britishaudiostore.com. This new arrangement will take effect from 11th August 2017. In accordance with Moth Group policy, all UK on-line orders will be sent standard post with no charge to the customer. Moth Group prices are shown inclusive of UK VAT at 20%, where applicable. Non EU customers: on entering a non EU address the website will automatically show the prices without UK VAT, and this will be made clear on the screen. At this point the various options for carriage will also be shown. In the normal manner, the customer is not committed to the purchase until the ordering procedure has been completed. to follow an alternative way to buy our products; or to receive advice before ordering; either contact us or telephone us on +44 (0) 1729 823 873 (or even write to us). If you're emailing from Outlook please ensure that the words ‘Ringmat Enquiry’ is shown in the subject heading or use our web browser based email system. We can then attend to you on a personal basis in our usual manner and this also gives you the added advantage of discussing your thoughts and requirements before placing an order. After contacting us for advice, you can later either telephone us again or go to our On-Line Store. We can handle credit and debit cards over the telephone, and receive cheques and bank transfers, thus giving a greater flexibility of payment.